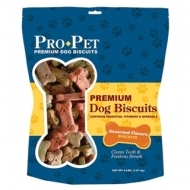 Treat your pup like a prince with Pro Pet Premium Dog Biscuit Assorted Flavors. Oven baked with only the best ingredients like real chicken, these biscuits are fortified with vitamins and minerals for optimum nutrition. The crunchy texture helps reduce tartar build-up and keeps your dog’s teeth and breath naturally clean and fresh.